attached to this family of three and I'm hoping for a sequel. When Bobby, Will and I all love a novel, you know something unusual is going on. In this case it's a funny, edgy, good-hearted send-up of all things Seattle; in particular a badly-located, upper-crust private school. But behind all the cleverness is a really touching, often hilarious story about an off-kilter but loving family. Add a little adventure, a little infidelity, the gradual revealing of the secrets of the back-story, and you have a very satisfying read. I became quite attached to this family of three and I'm hoping for a sequel. 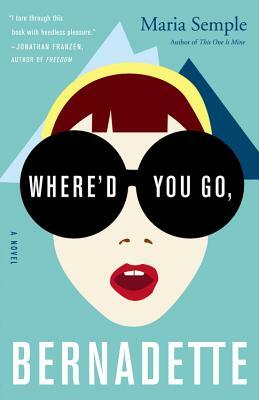 Maria Semple's first novel, This One is Mine, was set in Los Angeles, where she also wrote for television shows including Arrested Development, Mad About You, and Ellen. She escaped from Los Angeles and lives with her family in Seattle, where her second novel takes place.